This chapel was built in brick & terracotta by Mr A Roper of Wellington to a design by Elijah Jones of Hanley at a cost of �00. The foundation stones were laid on the 6th May 1898 and the chapel opened on the 21st October 1898. It had seating for 300 worshippers. It replaced a chapel (built in 1835) described as "small but beautiful", measuring 27 feet by 21 feet. It had 8 pews in 2 rows, rising by 6 inches in each tier. It was located on the opposite side of Tan Bank and opened on 29th May 1835. This chapel soon became too small for the growing congregation so was enlarged in 1837 at a cost of �0 & reopened on 25 June of that year. 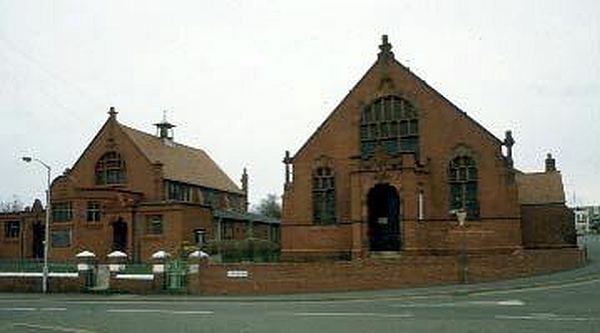 The 1898 chapel closed in 1966 when the congregation joined with the Methodists in New Street. The building on the left (originally the school) is now (2017) occupied by the First Church of Jesus Christ Apostolic. The building on the right is now a mosque.